I'm in love with Doodlebug sequins! 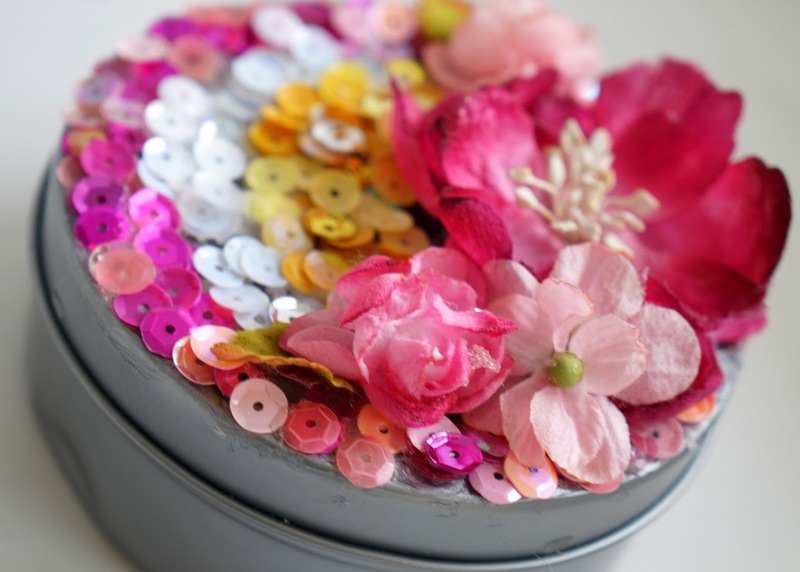 Amanda here today with a fun and easy gift idea using sequins. A while back I was at the store and I saw a pair of sequin earrings. I thought Doodlebug sequins would make lovely earrings so I started playing around to see what I could come up with. 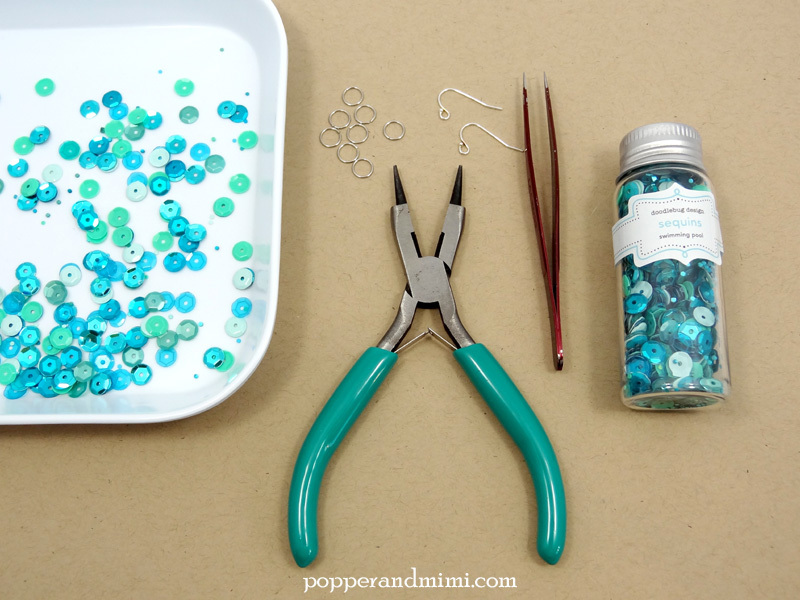 With a few basic jewelry supplies, a pair of sequin earrings comes together in minutes. You can customize the colors and vary the length with ease. I used Swimming Pool sequins to make this pair of earrings. I made a customized earring card by trimming a piece of patterned paper and adding some coordinating stickers. 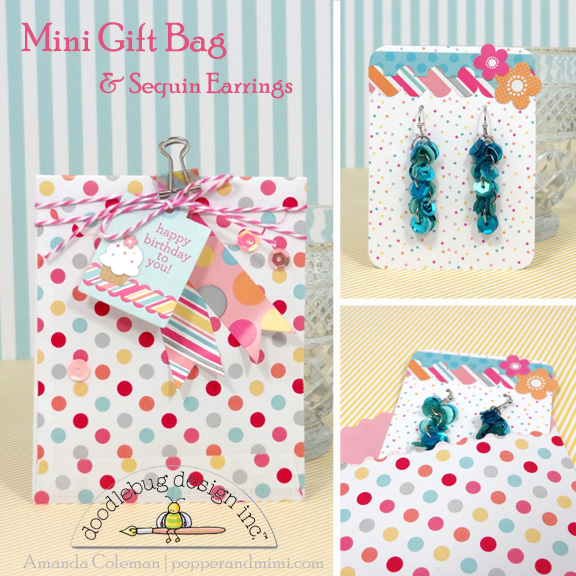 The earring card fits perfectly into the little treat bag. Just fold over the top and you have a sweet little gift. 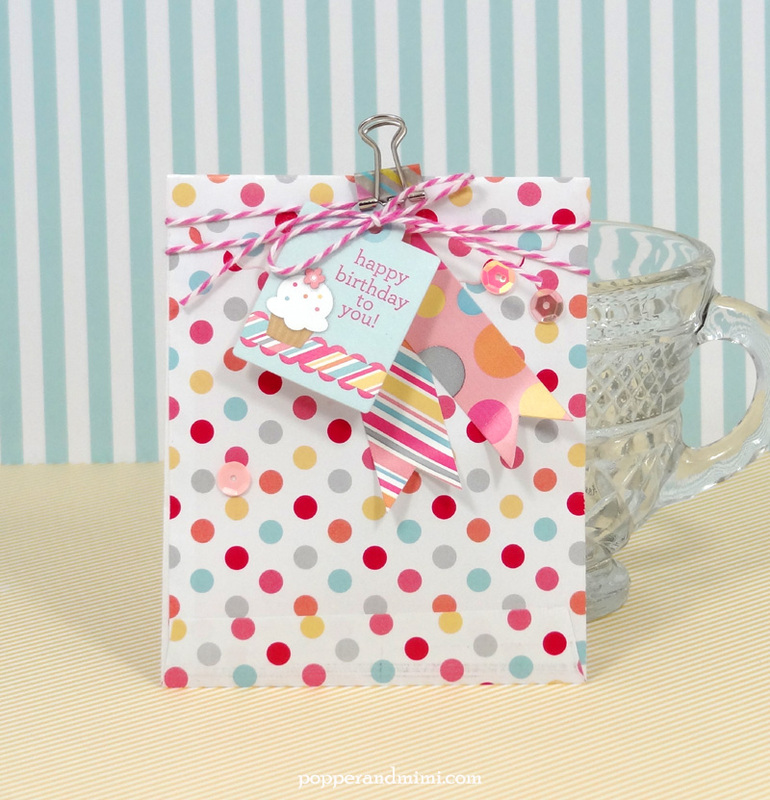 I used a tiny polka dot treat bag to make a little gift bag. I embellished the bag with stickers, sequins, and a birthday tag. I also covered a tiny binder clip with washi tape and used it to hold everything together. 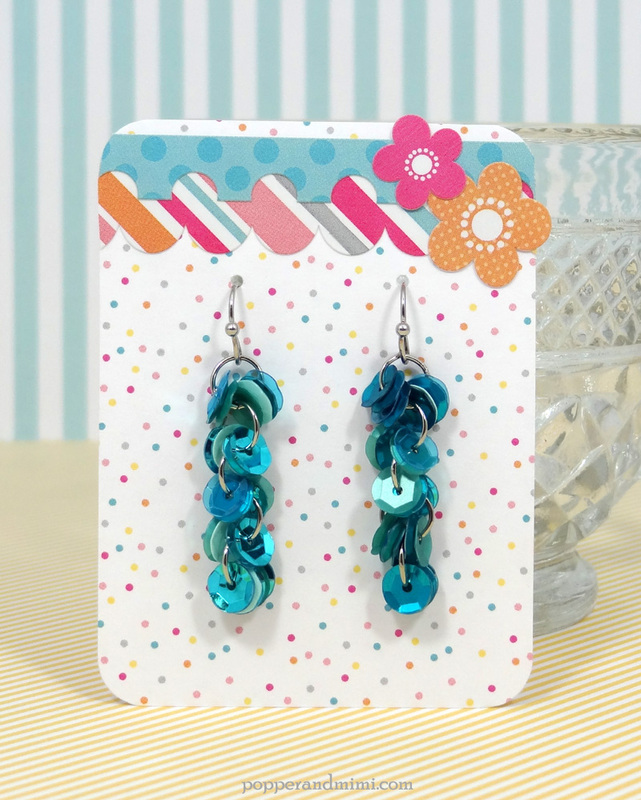 All of the supplies you need to make sequin earrings are readily available at craft stores and even larger stores such as Walmart. You will need: jump rings (tiny wire hoops with a split in one side), ear wires, small pliers, tweezers, and sequins. Start by grabbing a jump ring and twisting it open with a pair of pliers. Use your tweezers to hook several (6-8) sequins onto the jump ring. Close the jump ring using your pliers. This will be the bottom of your earring. Open a second jump ring and hook onto the first jump ring. Add 2-3 sequins on each side of the jump ring and close with pliers. Repeat this process until you have the length of earring you desire. When you are finished, attach the strand of sequins to your ear wires. 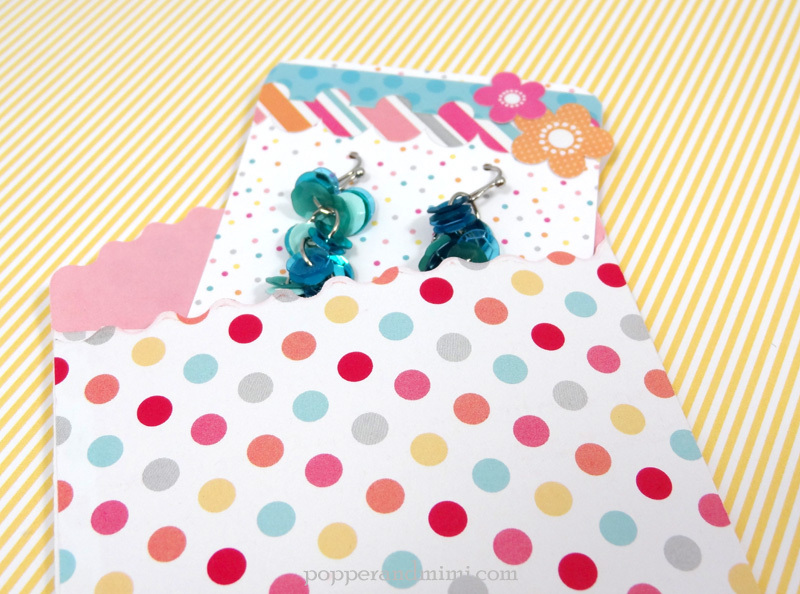 Add your earrings to a little card and they are ready for gifting! Hello there!! 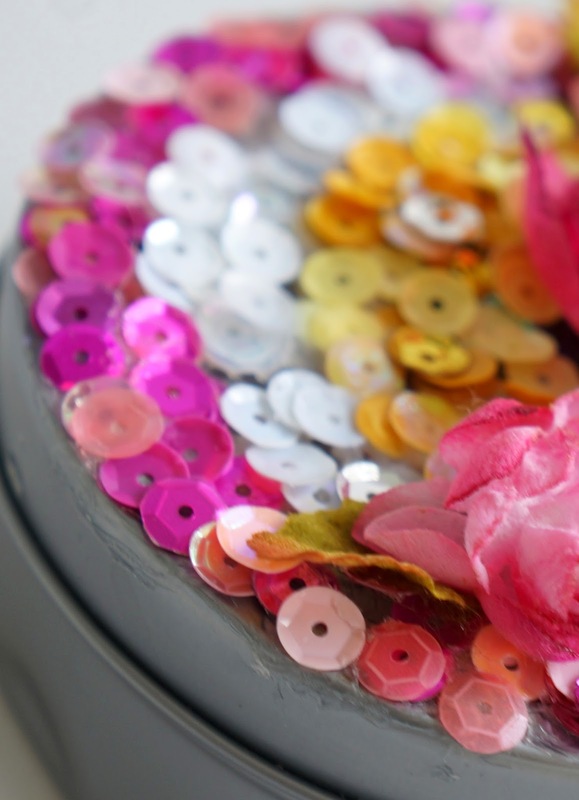 This month the Design Team is sharing projects using sequins. For those of you who already know, I need not stress on how, absolutely gorgeous the ombre sequins by Doodlebug are..! :) I'm sure you've been amazed by the inspiring projects so far. 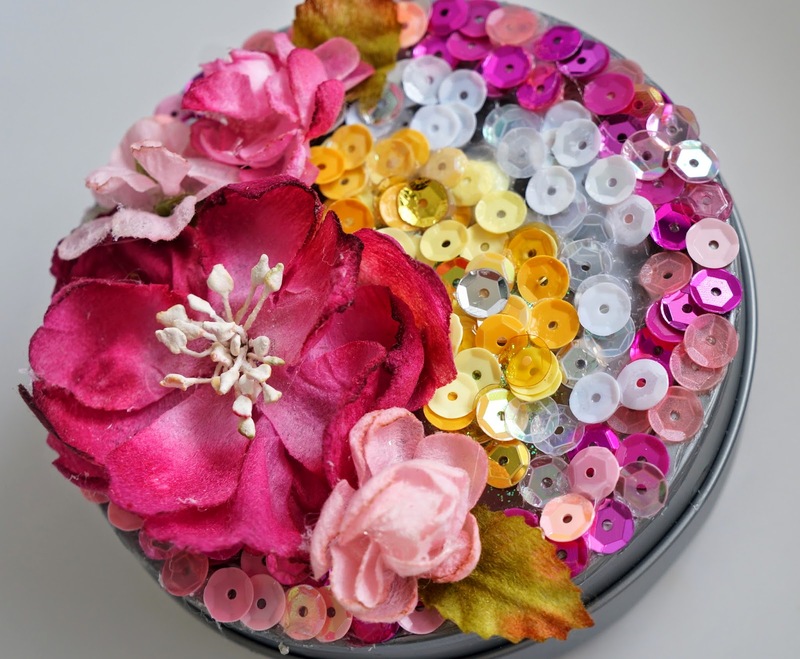 Today I'd like to share mine :) It's a trinket box that I made using 3 different colours of sequins and some flowers by Petaloo! Fab projects!! Amanda those earrings are spectacular and Sharn, the box is just gorgeous !! Oooooo 2 more projects to add to my sequins to-do list!!! I love the earrings--I have a store bought pair similar but I like the homemade pair even better! And the decorated mini tin is absolutely fabulous! Can't wait to try both and give them as gifts! I think people will just adore it! TFS!! Wow!!! These projects are so creative and amazing! I bought two sets of sweet shoppers treat bags and I am thinking I am going to be short because, there's so much to do with them. Now I got to get more sequins!!! These earrings are SO cute!! I knew I loved sequins - sequin earrings are even more adorable!! GORGEOUS gift box Sharm - LOVE your pattern & colours of sequins & flowers, BEAUTIFUL!!! I do have to ask what your heavy gel is? I've not used gels or mediums before, so I'm not really sure what to look out for. Thanks in anticipation. Amanda and Sharm impressed me so much with these fantastic ideas!! Thanks so much ladies! !